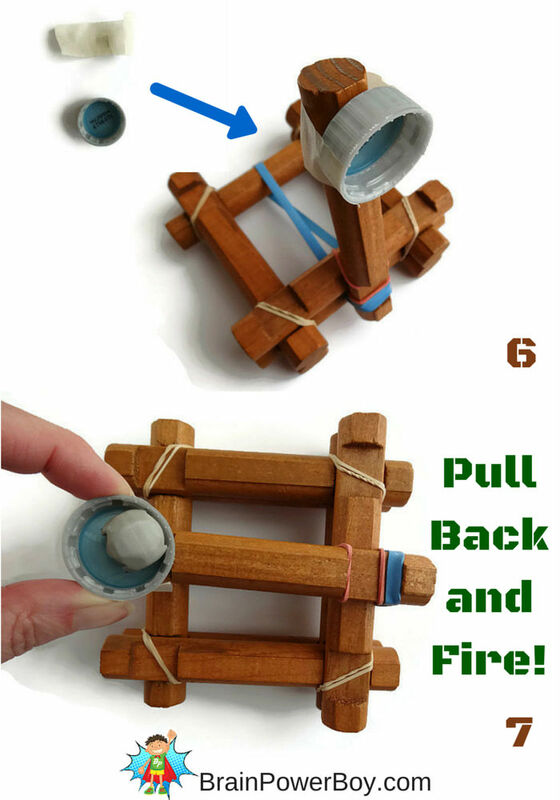 You can make a catapult out of Lincoln Logs! Our step-by-step instructions with images will show you exactly how to do it! 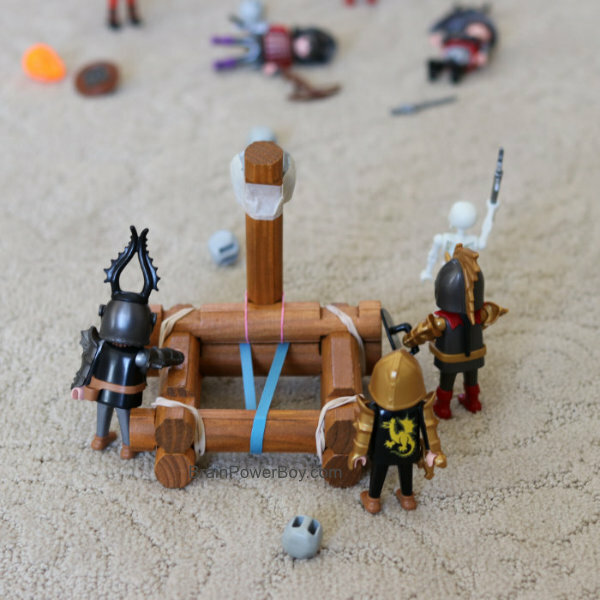 One day, when my son and my husband were setting up one of their elaborate log buildings and forts scenes, they decided they needed some catapults so they could shoot at each other’s forts. 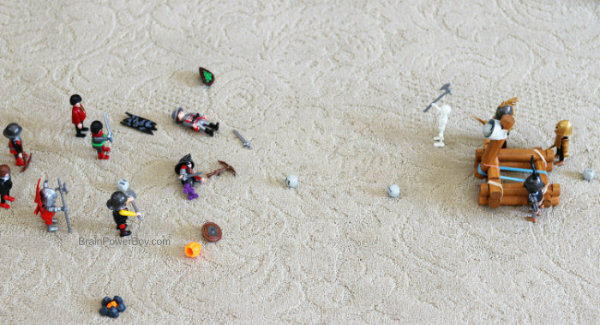 Then they used it with our Playmobil sets and had even more fun. They set out to build one out of toy logs. It turned out great and was a lot of fun to play with. 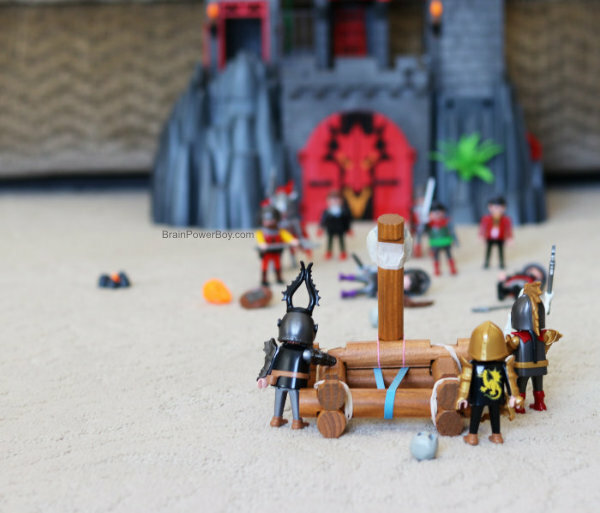 I just love activities that get my son learning, as well as playing and having a great time. (Be sure to see all of our other activities for boys as well! 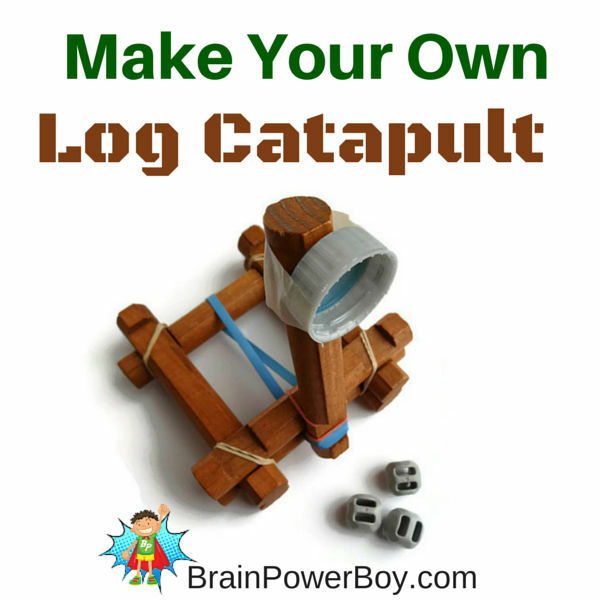 Why not Make Your Own Log Catapult? 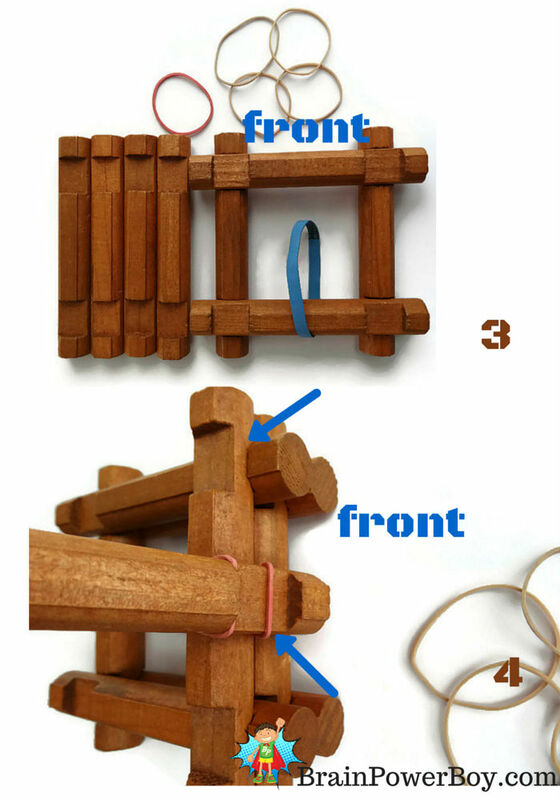 Follow the easy tutorial below to build this fun DIY toy. I’m sure your kids will get a lot of satisfaction out of building it – and shooting it! NOTE: Be sure to watch the video at the end showing you how to assemble it! 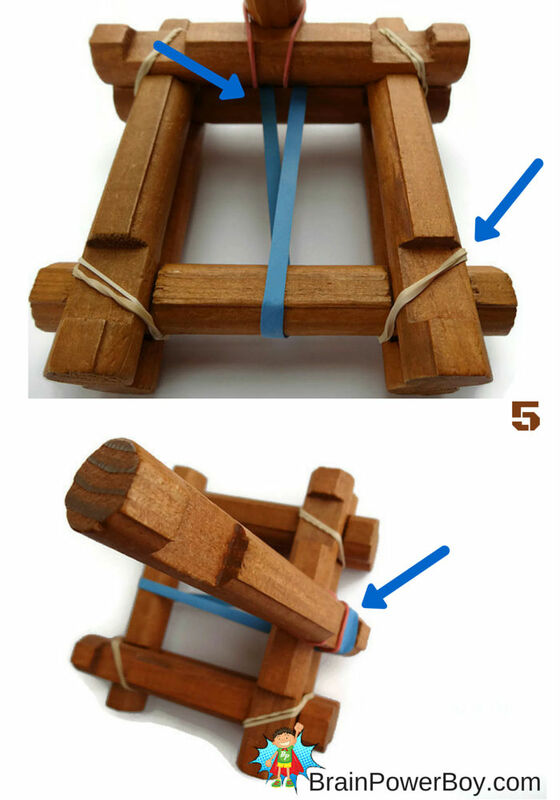 Grab your materials and then follow along with the close-up images to make the catapult. The steps match the image numbers to make it easy to follow. 8 2 slotted logs – These are the logs my son got when he was little and we love them. You can use our step-by-step tutorial with pictures and we also included a video at the end of the post to help you make this. Logs needed and sizes of rubber bands. Create a box with 4 logs. Add strong 3″ rubber band to the back log. Note: The front of the catapult does not have a rubber band on it. Add 2 logs to the sides, going from front to back. Add 1 more log to the front going from side to side. Check image 4 to make sure it matches the image. Once you start adding the rubber bands, always make sure they are in the grooves. To add the catapult arm piece, loop the red rubber band around the top front log and slip the catapult arm log into the rubber band loop. Secure the 4 ends of your build by double looping rubber bands over the corners where the logs intersect. Stretch the strong (blue) rubber band toward the front and slip it between the two front horizontal logs. This is a little tricky to do. Once you slip it in between the logs, stretch it up over the bottom of the catapult arm log. Take a soda bottle cap and attach it to the arm with masking tape. Step 7: Load your catapult bucket with ammunition, pull back and FIRE! 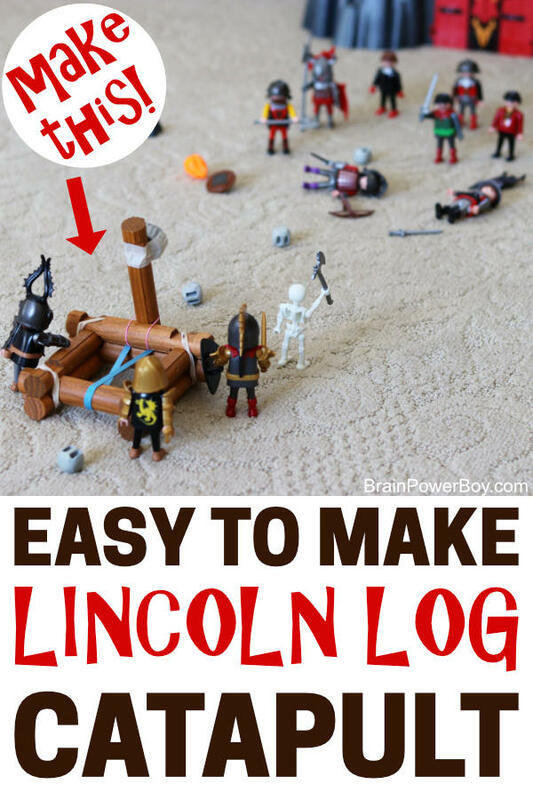 I hope you and your kids enjoy trying out this Lincoln Log Catapult project and that you experiment and design one of your own as well. This is a fun activity that is packed with learning opportunities. 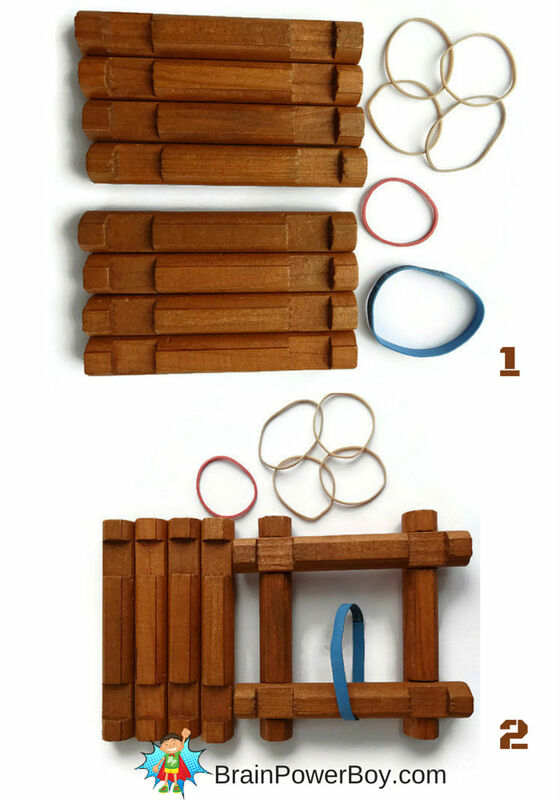 You can expand the learning a bit by reading about the history of Lincoln Logs in this article. Very interesting. This is Lincoln Logs set we have. It has served us well over many years. I did add some additional logs as we build big lol. We have multiple Playmobil Castles. The ones we own are discontinued but you can see what is available here. 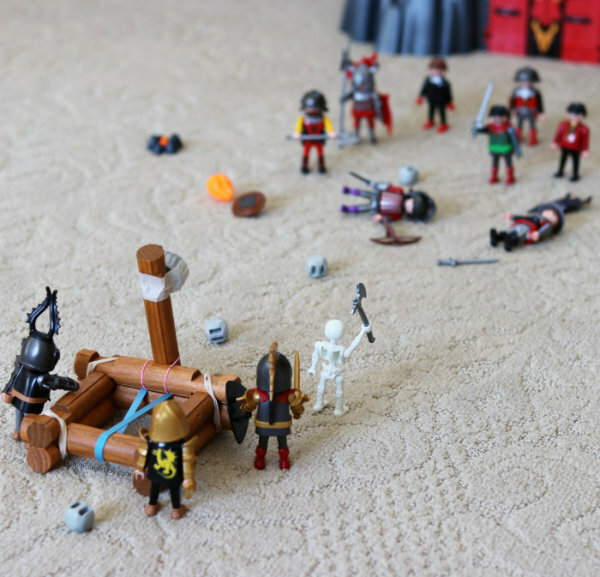 Playmobil is an investment, just like LEGO is. They are not super cheap, that is for sure, but they would easily make my list of the top 10 toys ever and we have a lot of Playmobil sets and figures. I hope you enjoyed making your own log catapult! It is such a great project! I also wanted to let you know that this project was featured in the book Learn with Play: 150+ Activities for Year-round Fun & Learning – super exciting to have our project in a book. It is simply packed with fun play ideas for kids. Thanks Carolin, So glad to hear you think it is cool. Have fun building it with your daughter! My daughter has tried Lincoln Logs and never really caught on to them. I have a feeling a homemade catapult will have her begging to play with the things, lol! Awesome idea! I hope she likes making it AND playing with it Emma. I have to admit, it is really fun! This is so cool! My son will love making and playing with this. Thanks for the detailed tutorial ? You are most welcome Tina. I hope he has a great time! If he is asking, then you are right Devon – you better get some Lincoln Logs 🙂 Have fun! What a fantastic project, my boys are going to love this. You know, I never would have thought to take the logs and make a catapult out of them, you’re a genius. Well, it is my husband and son that deserve the credit and I will be sure to pass your kind words on to them. Coolest lincoln log creation ever! I’m showing this to my boys and challenging them to re-create it on their own! Thanks Ashley! I love that you are showing them and having them re-create it 🙂 Fun indeed. I’m so glad you liked the instructions. You are right, it is a nice starter catapult. Thanks for stopping by.